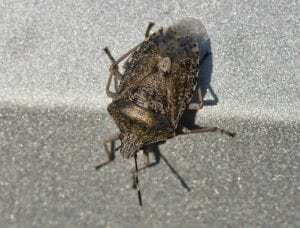 The brown marmorated stink bug (BMSB) has been in California for more than 15 years in primarily urban environments, but the pest has now been increasing its presence in agricultural areas. Populations of BMSB have become established in the urban portion of 16 California counties and has been trapped in 18 more. Noticeable damage in peach orchards and vineyards started being reported last year and instances of infestation have seen a significant increase this year. The bugs can damage multiple different types of fruits, vegetables, and nuts. Last year around this same time the pest showed up in almond orchards in the northern San Joaquin Valley and has now officially been listed by Stop BMSB as a preferred host. Damage and infestation in areas of Stanislaus and Merced counties are already being reported this year. Brown marmorated stink bug populations can take a while to establish in large numbers, but once they do they can cause severe losses since even immature stages of the pest can actively feed on fruit. The full extent of what kind of threat the bug poses for nut crops is still unknown. It can also be difficult to identify the pest based on damage to nuts alone, as it can often look very similar to damage caused by other common stink bugs. BMSB is also similar in appearance to other brown stink bugs, aside from a white band on their antennae. It is important to be vigilant when monitoring for the bug to prevent the spread of infestation into other parts of the state. 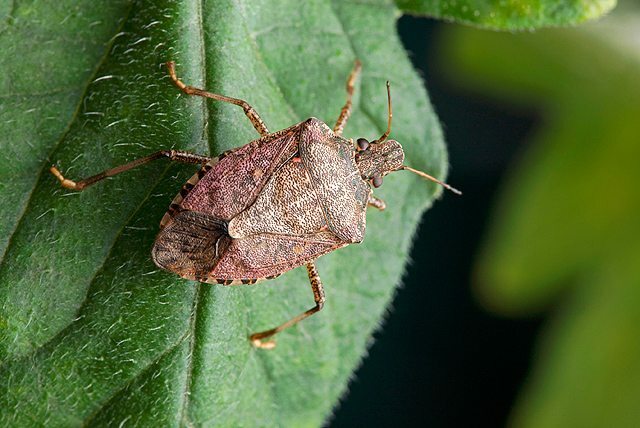 For growers and pest control advisors who believe they have found a brown marmorated stink bug in a field, orchard or vineyard, it is recommended that the bug is collected and taken to the local UC Cooperative Extension office. There is ongoing research evaluating BMSB damage to better understand the most effective times for monitoring of specific crops.